Dr. Gunawardene is a Diplomate of the American Board of Internal Medicine. He graduated from St. Georges University and completed his Internal Medicine residency at Coney Island Hospital-Affiliate of State University of New York in Brooklyn, NY and has been practicing medicine for twenty-three years. Dr. Gunawardene is Chief of Department of Medicine and a member of the Medical Executive Committee at Wellington Regional Medical Center. He is the Director of AMC Hospitalist LLC, a hospitalist company that provides services at JFK Medical Center and Wellington Regional Medical Center and Advanced Medical Clinic, PA located in Wellington at Palomino Park. Dr. Gunawardene is also an Adjunct Clinical Associate Professor in Internal medicine for Lake Erie College of Osteopathic Medicine, has an extensive involvement in geriatric care and is an Advisor to multiple Rehab centers in Palm Beach County. 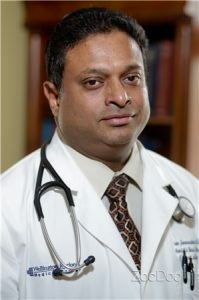 Since 2006 to late 2013, Dr. Gunawardene spent most of his time as Assistant Program Director of the Internal Medicine Residency at Wellington Regional Medical Center, devoting most of his time training post-graduated medical residents and students, who later went on to accept many prestigious positions, as well as becoming local area physicians. He was awarded The Golden Apple Award for outstanding leadership and devotion to the Residency program for two consecutive years, 2010 and 2011 and also received The Distinguished Mentor Award in 2013.